A victory for Trump in Indiana on Tuesday would be a dispiriting blow for Cruz and other forces trying to stop the front-runner. LA PORTE, Ind. – Facing a make-or-break moment for his slumping campaign, Texas Sen. Ted Cruz was blitzing through Indiana on Monday in a desperate bid to overtake Donald Trump in the state’s primary and keep his own White House hopes alive. A victory for Trump in Indiana on Tuesday would be a dispiriting blow for Cruz and other forces trying to stop the front-runner, leaving them with few opportunities to block his path. Trump is the only candidate in the race who can reach the 1,237 delegates needed for the GOP nomination through regular voting, though Cruz is trying to push the race toward a contested convention. The Trump campaign questioned whether a viable path can exist for Cruz if he loses Indiana – if he even has such a path now. Several hundred people came to see Cruz on Monday at Bravo Cafe in Osceola, where he predicted a close finish in the primary. “You’re the perfect man for the job,” a man told him as diners consumed coffee and eggs. “God bless you,” Cruz said, gripping his hand. 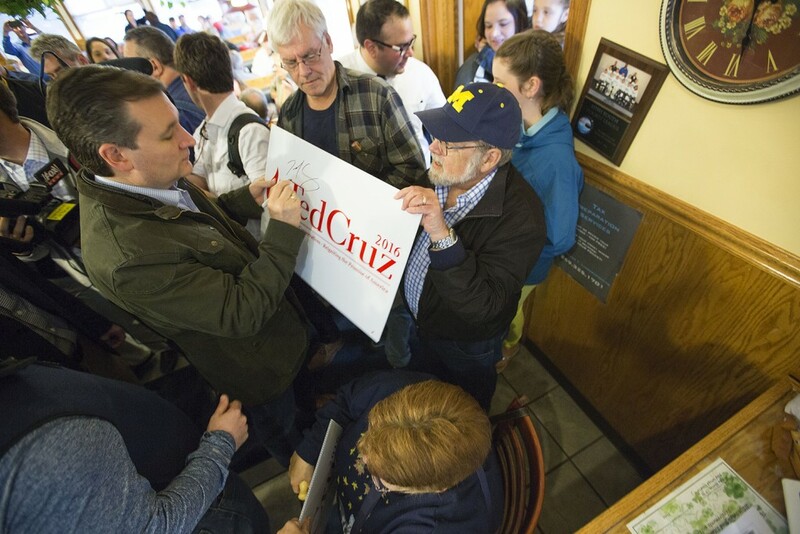 Cruz was holding five events across Indiana on Monday. Trump was holding a pair of rallies in the state, though he was already confidently looking past Cruz and setting his sights on Democratic front-runner Hillary Clinton. “I haven’t started on Hillary yet,” he told CNN, although actually he’s been trashing her record for quite some time. For her part, Clinton told thousands at an NAACP dinner in Detroit on Sunday that President Barack Obama’s legacy can’t be allowed to “fall into Donald Trump’s hands” and be consumed by “these voices of hatred.” She cited Trump’s “insidious” part in the birther movement that questioned Obama’s citizenship. Clinton’s campaign announced Monday that she had raised $26 million in April as the fundraising juggernaut of rival Bernie Sanders slowed. Sanders has vowed to stay in the Democratic race, though he acknowledged Sunday that he faces an “uphill climb.” His only path rests on a long-shot strategy of winning over superdelegates, the elected officials, lobbyists and other party insiders who are free to back either candidate. Trump can’t win enough delegates Tuesday to clinch the Republican nomination. But after his wins in five states last week, Trump no longer needs to win a majority of the remaining delegates in coming races to lock up the GOP nomination. But that strategy, which appeared to unravel even as it was announced, can’t help either man with the tens of thousands of Indiana voters who had already cast ballots: Early voting began in Indiana three weeks before they hatched their plan. Trump went after Cruz on Sunday, suggesting evangelical conservatives have “fallen out of love with him” and mocked his decision to announce former GOP presidential candidate Carly Fiorina as his running mate. Associated Press writers Jonathan Lemire in Terre Haute, Indiana, and Julie Bykowicz in Washington contributed to this report.